With Super Bowl coming up, this fun class is good timing. Ann turns pizza into a quick, easy even healthy family meal that’s great for sports fans and patients alike. Her method takes away all the kneading and twirling that goes into making great pizza dough by using flatbreads like pita bread and naan for the pizza base and adding an assortment of easy delicious toppings from artichokes to figs, and, of course, cheese. Look and learn! There’s really nothing better than fresh mozzarella on pizza. It compliments just about any ingredient, but it works especially well with artichokes and salty black olives. The canned artichokes we use here are an easy, juicy addition to make this Artichoke, Arugula & Olive Pizza extra delicious. We suggest topping the pizza with arugula after baking, to give it a refreshing raw crunch, but if you are on an anti microbial diet, it tastes just as good without. Look and learn! As you all know, we teach healthy cooking to people touched by cancer. The mix of figs and goat cheese in this simple, quick Fig & Goat Cheese Pizza makes it the epitome of sweet and salty. It’s the perfect wake up call to a palate that’s been jaded by chemo. It is truly delicious. Since it uses pre-made naan, the Indian flat bread, it’s a snap to make too, a real gourmet dinner in a hurry. Give it a whirl. We teach healthy cooking to people touched by cancer. Pita pizzas rule! 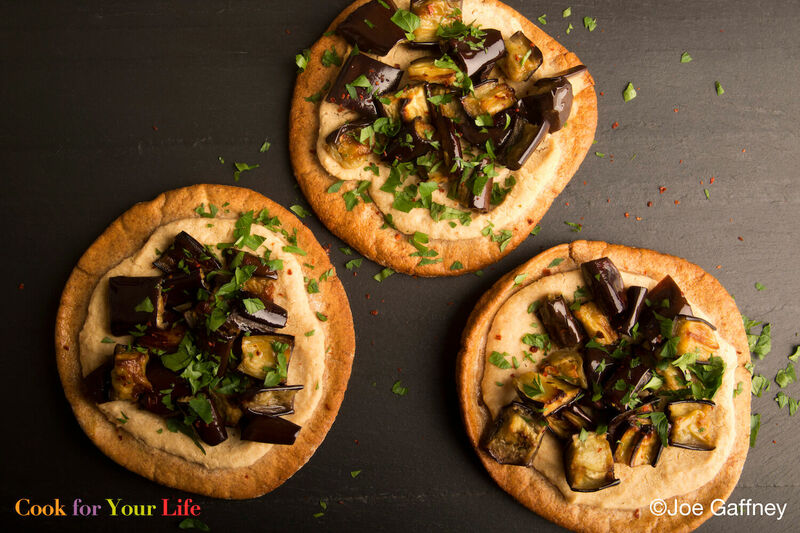 This eggplant pita pizza is a comfort food that we can honestly say is good for you and it’s totally vegan. With roasted eggplant layered over white bean hummus, this delicious, easy to make recipe contains a slew of phytonutrients, many which are active antioxidants, along with a variety of vitamins and minerals — and that’s before we talk fiber! Go for it. Ann runs you through the different types of flatbreads that are so good to use to create all types of delicious, quick pizzas. Flatbreads freeze well, so along with a few toppings from your pantry. You’ll have your own home pizzeria ready on hand, on demand!